The Raymond Arts Alliance is hosting the second presentation of the “Short Set Concert Series” on Saturday, June 16th at the Raymond Village Church, 27 Main Street in Raymond. The series is designed to provide a sampling of music, in one setting, for the audience’s entertainment and enlightenment. This concert offers an exciting evening of music with three different bands, each playing a short 25-minute set. This event features music from the Celtic, Latin, and Middle Eastern traditions. The Celtic group is the husband/wife duo of Sharon (guitar) and Perry (fiddle and more) Newman. They have been making beautiful music together for a long time. After dinner with friends one night, they formed an Irish band, Sligo Road, which took them down a much different path than their classical training intended. While the band is no longer performing, their music continues! 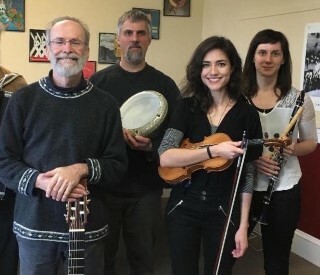 The Middle Eastern group, Zapion, performs music from the Turkish, Arab and Balkan traditions and has been active in Maine for eight years. A student of the late Udi Alan Shavarsh Bardezbanian, Eric LaPerna, formed Zapion in 2010. Zapion got its name from a Greek Tavern that Udi Alan used to perform at in the 70s. Members include Eric LaPerna (darbuka), Sarah Mueller (violin), Maria Wagner (clarinet, nay) and Gary Wittner (7 string guitar). The Latin group consists of Rafael Freyre (bass/vocals), Eric Winter (vocals/congas) and Gary Wittner (guitar/vocals); all of whom have been performing Latin music locally and regionally for many years, with groups such as Dos Canosos, Primo Cubano, Grupo Mofongo, Sly Chi and more. This group played at the first “Short Set Concert Series” hosted by the Raymond Arts Alliance. The group interacts well with the audience and it is hard to sit still listening to the Latin beat! The concert is free and open to the public, however a suggested donation of $10 is appreciated. These groups are performing for the pleasure of your entertainment and their love of music. They are only taking a small stipend from the donations. Doors open at 6:30 p.m. and the show starts at 7 p.m.